During a Whole 30, some people find they miss certain foods or genres of foods. We don’t eat a lot of pasta since the girls are gluten free, but every now and then we will pick up a package of gluten-free noodles and make spaghetti. 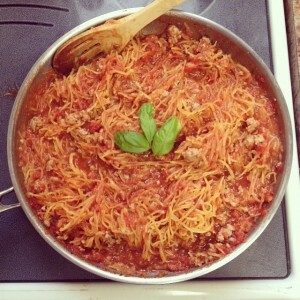 So during our Whole 30 last month, I wanted to find a way to replicate that spaghetti flavor, but without the noodles. Enter the spaghetti squash. I have tried a recipe with spaghetti squash before, and it did not go well. I’m pretty sure that was more that I didn’t know how to cook it properly, but I’ve stayed away from it since then. But not this time. I decided to try it again, and I’m glad I did! Everyone in the family cleaned their plates, and some of the kids asked for seconds. A meal that is a winner for six people? Yes please. 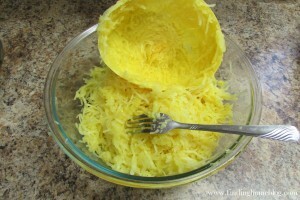 To cook squash: Cut spaghetti squash in half. Scrape out seeds and pulp from the middle. Place cut side down in a 13×9 pan with 1/2 cup of water. Cook in a 375°F oven for 45-55 minutes. You’ll know it’s done when you can scrape a fork along the inside and get squash noodles. Let squash cool until you can hold it to scrape the insides. 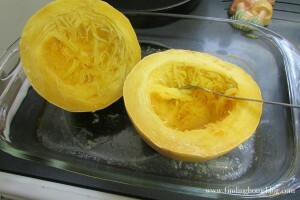 Using a fork, scrape squash noodles until peels are empty. You can do this ahead of time, and just store the squash noodles in the refrigerator. In large skillet, cook the Italian sausage. Once it is cooked through, drain most of the grease. Add remaining sauce ingredients and simmer for 5 minutes to let flavors combine. 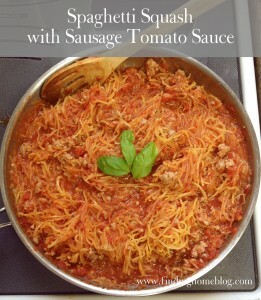 Add squash noodles and toss with sauce. Simmer for a few more minutes, until heated through. Garnish with fresh basil. Want more yummy recipes? 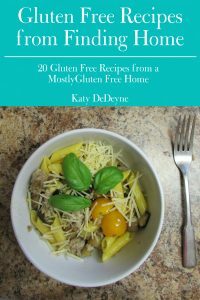 Sign up below to get your copy of Gluten Free Recipes From Finding Home: 20 Gluten Free Recipes From A Mostly Gluten Free Home. I’ve never tried the squash but always have wanted to. I’m going to do it now. Thanks for the recipe!